Converge on downtown Mobile and experience Ten65-a free, two day event that celebrates music, technology, and the culture of this awesome city on the rise. 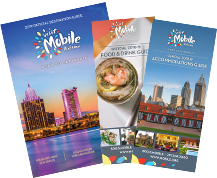 Mark you calendars now for fun and music in the streets of Mobile October 5 - 6, 2018. Scroll down to check out our Special Ten65 Discounts (Hotels & More) below! Visit ten65festival.com for complete details!